In Snoqualmie Pass, a ski station in Northern Washington, we say goodbye to Dutchess. He leaves the trail for a whole week to attend a wedding (he is the 3rd of our group who will leave the trail for a while). Now our group shrunk to three: Mr. President, Bowie and myself. Luckily, we made friends amongst the many hikers that are around. We take a zero and the next day we hike out together with Brad, Maverick and Phatty. We hike up to Snow Lake. 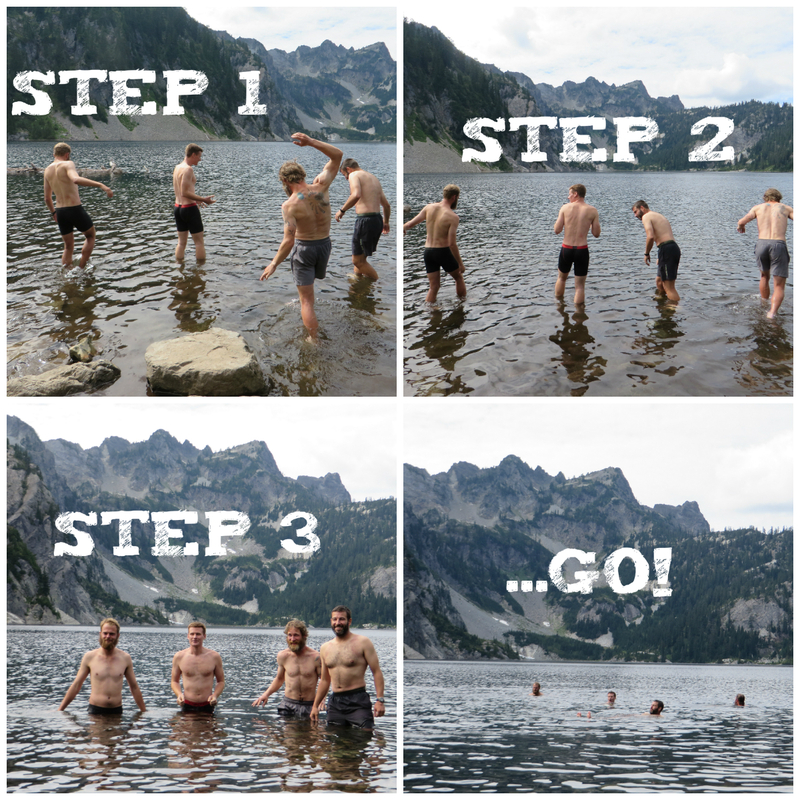 No snow, only an ice cold glacier lake where the guys are taping a customized ice bucket challenge for the ALS foundation. And ice cold it was! Check here for the video. After Stevens Pass, the weather is changing to Washington standards. And that means: rain. We celebrate my halfway point (I hiked half of the entire Pacific Crest Trail, 1330 miles) with a shot of cinnamon whisky and after this glorious moment I lose my crew. Nobody is motivated to make miles today but I have lots of energy and I want to take advantage of this rare occasion. 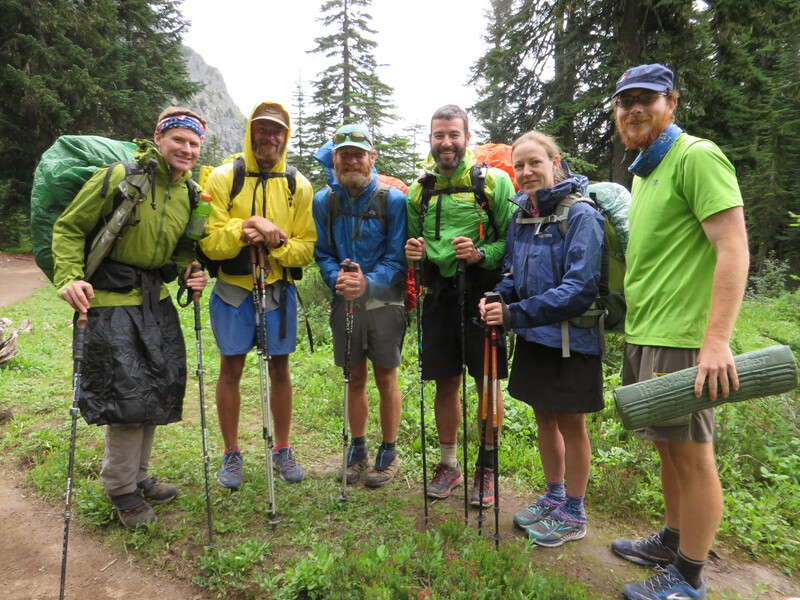 Stehekin, our next resupply point is 4 days hiking away and the weather forecast doesn’t look good at all. I’m the first to hike out and assuming the rest will follow. 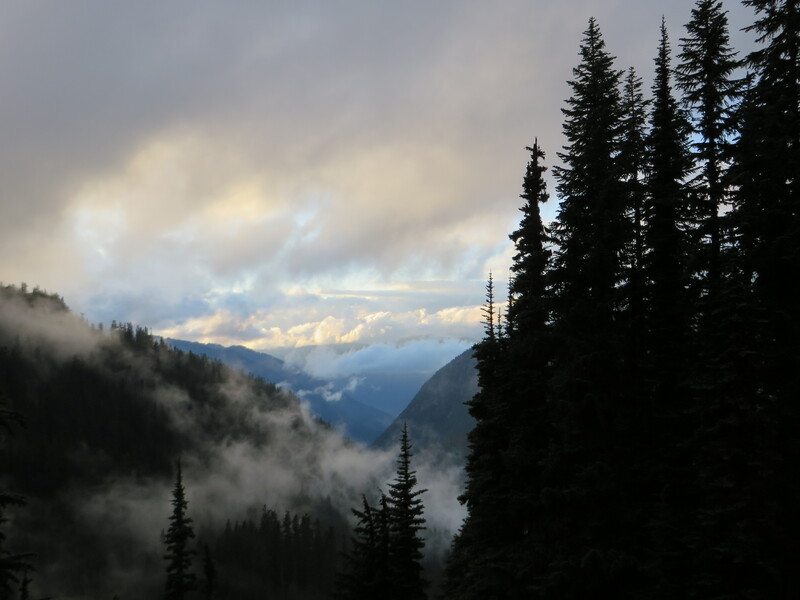 When I reach a ridge top with a smashing view over the Cascades, I take a long break to wait for my crew to arrive. But after 90 minutes, nobody has showed up. Dark clouds are rolling in fast and I’m getting colder. I need to get moving, daylight is fading. I reach Pear Lake at around 8 pm. It’s dark and it started raining. I pitch up my tent and eat my dinner inside. I fall asleep to the sound of the pouring rain on my shelter. The next day I wake up to a rainy world. It’s so tempting to stay in my dry and warm sleeping bag but I have no other option than to hike out. I only carry food for 4 days and I have to get moving. No sight of my crew at all. I feel lonely and the rain and the fog doesn’t make it better. It rains non-stop today. For 13 hours straight I hike. I can’t see around me, I only have my eyes on the trail, afraid of slipping and falling. The landscape is hidden behind a veil of fog and stays hidden for the rest of the day. When I climb to a ridge top, it starts pouring down on me. I want to cry but I can’t even. I start to sing Dutch songs. That helps lifting my mood a little bit. I’m alone but I know there are hikers ahead and behind me. Struggling through the rain like me. It’s strange but the fact we’re all in this together, yet apart, feels comforting to me. I only stop for a toilet break. Pooping in the pouring rain feels….different. And wet. I eat my bars as I go. My hands are freezing cold. My gloves are soaked. I can’t feel my fingertips anymore. My hand palms all wrinkly, like I have been sitting in the bathtub all day. That night I find a flat spot near the trail. It is still raining and I’m pitching my tent, which is still soaking wet from the night before, also on the inside. Literally everything is wet. I hiked in my rain gear but even the best equipment doesn’t stay dry after 13 hours of ongoing rain. Luckily, my sleeping bag and my sleeping clothes (thermals and socks) are dry. I cook and eat inside my tent and for the 2nd night in a row, I fall asleep to the sound of the pouring rain. The next morning I wake up to a dripping forest. But it doesn’t rain anymore! I swap my dry sleeping bag and clothes for my wet hiking outfit and I hike out, all by myself again. No sign of my crew. I feel lonely and sad but there is nothing I can do about it. I have to keep moving. I’m running out of food and Stehekin is still 2 days away. And for a change, it starts raining on me again, but when I climb out of the forest towards an exposed ridge top, the sun breaks through the clouds and then the veil of fog is lifted. What I see is incredible: Glacier Peak in all its glory. The sun warms my face and I start to cry from exhaustion and from the out-of-this-world beauty I see in front of me. I sob like a child, I can’t help it. I feel overwhelmed by the beauty and strength of nature. And I feel so, so tired. Then the curtains close, the mountain hidden again behind the clouds. And again, the rain pours down on me. For the 2nd day in a row. That night, I sleep in a thick, damp forest. Stehekin only 1 day away. I’m getting close. In the morning I hike out, alone. Finally, the weather improved. I even get a chance to dry out my stuff. The sun is vaguely present but hiking like this feels so light. 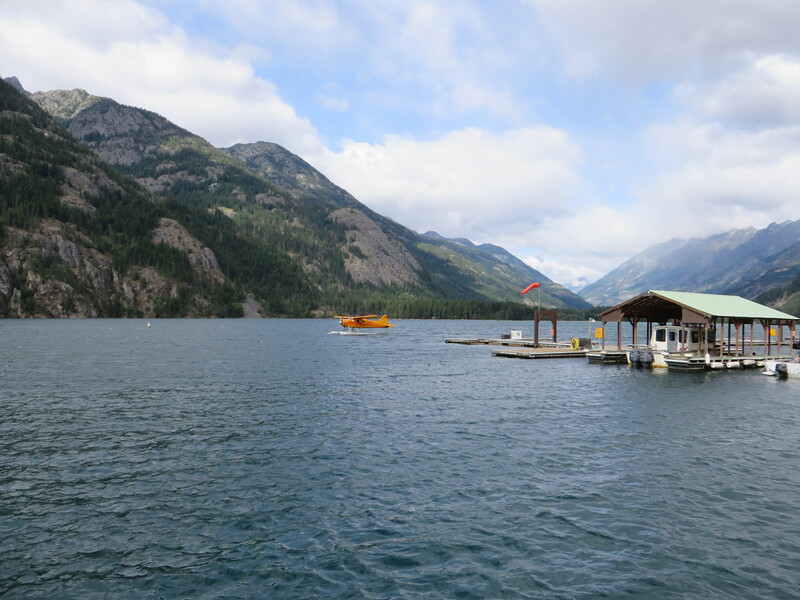 I arrive at High Bridge, the trail head from where I take the bus into Stehekin, the cutest little town on the banks of Lake Chelan, only accessible by foot (PCT), by boat or by seaplane. I’ve never been more happier to be back in civilization again.